The Shores in Gulf Harbour, 33908 offer stunning panoramic views of the Caloosahatchee river greet you when you look out your luxurious condominium windows. The fantastic high-rise condos of The Shores at Gulf Harbour offer incredible views of the marina as well as the waters beyond. 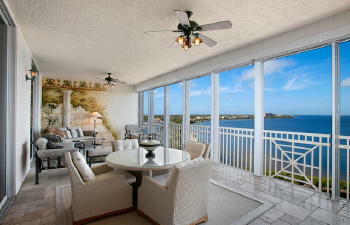 Residences are located in three, ten story buildings, maximizing the amazing views offered. The units here all have between 2,109 and 3,331 square feet of living space. They offer both two and three bedroom floor play layouts to accommodate all their residents. Feel free to Contact Shellstar Realty. Our Realtors have many years experience and can help you obtain the best price on your real estate purchase!